Black Rabbit01621 855706work Guest AccommodationThis is a basic bedroom that meet your needs but need a little glamour and that will come in time! Black Rabbit is a fun and family friendly pub on Maldon high street just a short walk from Promenade Park. The rooms are comfy but basic and provide the perfect base for stop overs and visitors to the local area. The bedrooms have their own entrance, shower rooms and each room has kettle, TV and fridge. There is free parking for all guests. Black Rabbit pub is open from noon every day and serves delicious food and great cocktails as well as having a huge beer garden on your doorstep. Please note: this is a lively pub so it can be a little noisy in the evening. Perfect location if you want to join the fun and have a very short walk to bed! This is a basic bedroom that meet your needs but need a little glamour and that will come in time! 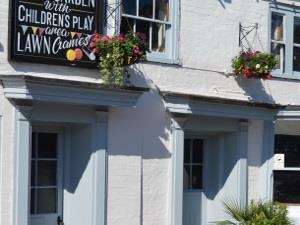 Black Rabbit is a fun and family friendly pub on Maldon high street just a short walk from Promenade Park. The rooms are comfy but basic and provide the perfect base for stop overs and visitors to the local area. The bedrooms have their own entrance, shower rooms and each room has kettle, TV and fridge. There is free parking for all guests. Black Rabbit pub is open from noon every day and serves delicious food and great cocktails as well as having a huge beer garden on your doorstep. Please note: this is a lively pub so it can be a little noisy in the evening. Perfect location if you want to join the fun and have a very short walk to bed! Centrally located on the high street, close to shopping and banks with a very short walk to Promenade park and the river Chelmer and 5min drive to the Heybridge basin.